We all know change over time is way more than we want it to be, Always longer than we estimate it to be, And the timing is never convenient. 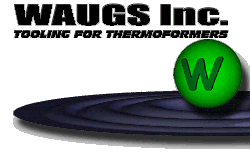 Most thermoformers are aware of quick-change tooling But for whatever reason don’t utilize it. I believe this is because they have painted themselves into a corner over the years. Thinking there is no way to consolidate all the varied and assorted tooing into one system. If your looking at an off the shelf item your right. I have yet to see that. However once we understand the particulars of your tooling and operating philosophy a tailored system can be achieved. We have a unique insight in that we have seen many thermoforming operations. Some we provide all there tooling and some Just a portion and One thing is for sure, no two are the same. The isolation has caused evolution along different paths and is actually quite amazing. American ingenuity shows itself in that many different people have solved a slew of different problems in there own unique way. Although it appears a daunting task, we will work with you. As we have been through it before and know where to and not to tread.